Town of Osgood, Indiana March 2018 Meeting Minutes. Present at the meeting were Tammy Wilhoit, Norman Kappes, David Bultman, Tina Wallace, Kyle Negangard, Gene and Paula Flint, Gene Flint Jr., Lynn Fledderman, Nick Buchanan, and Will Wallace. Roll Call – Holley Rose was not present. 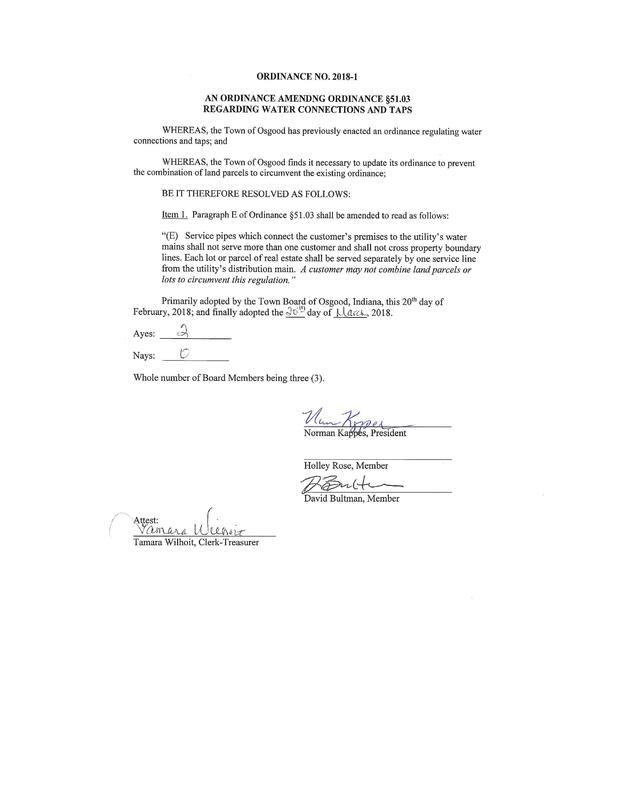 2nd reading of Ordinance 2018-1: An Ordinance Amending Ordinance §51.03 Regarding Water Connections and Taps. Verbiage was added that states: “A customer may not combine land parcels or lots to circumvent this regulation”. 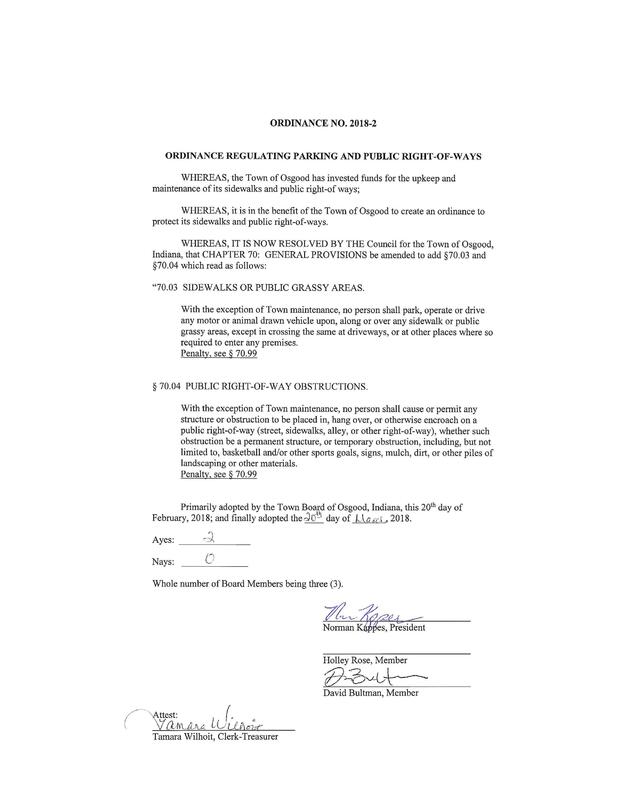 2nd reading of Ordinance 2018-2: An Ordinance Regulating Parking and Public Right-of-Ways. Verbiage was added that states, “With exception of Town maintenance”. Ordinance 2018-3: The Creation of a Rental Registration and Inspection was tabled from last month. Ordinance 2018-5 was presented for the 1st reading. An Ordinance creating Fund 811 for Credit Card Service Fee/Utility Payment Clearing. A letter was prepared to the Indiana State Engineer for USDA to accept certification that the Town of Osgood requests and approves Mr. Robert Ross, Resident Project Representative (RPR) and Mrs. Rachel Runge, P.E., from Commonwealth Engineers, Inc., on the Water Project for RPR services. In addition, the Town requests and approves Mr. James Clevenger and Mr. Jeff Marrs, both RPR’s from Dixon Engineering, Inc.
Lynn spoke with Christina DeWitt concerning the Napoleon Water negotiations. Christina had concerns over the proposed amendment. Lynn advised Council to reject the proposal. Lion’s Club is requesting to be at the stoplight on May 5th. April 5th at 5:00 P.M. an executive session will be set up to discuss employment issues. Water Department – Nick Buchanan stated that they had focused on getting all the new meters installed this past month and they are all in. They will be performing some testing on the meters and have placed the devices under the meter lid for protection. They have pulled meters that are no longer being used and plugged the lines. They discovered that 4 meters were discovered to have been turned on with our knowledge. The hydrants at State Road 350 and Finks have been fixed and 2 setters have been replaced. LC United started work on the water tower. 10 first responder EMS runs, 3 fire, and 2 motor vehicle accidents for a total of 15 runs. February training consisted of Members participating in a pipeline safety course in Dearborn County, in house SCBA Training, Tanker operations, and 5” soft suction and hydrants. Members voted on one member to run EMS. Gene and Paula Flint were present to express their opposition to proposed Ordinance 2018-3. Gene spoke and felt it was extorting money from working people. People are investing money in the town and the cost of everything keeps going up. They do month to month rentals because they rent to the working poor. Now when renters can’t pay their utilities or rent, they go to the trustees, churches, and ministerial associations which puts more pressure on them. If he is charged an extra fee for inspections, he is just going to pass it on to the renter. He believes that 90-95% of the rental properties are taken care of because of the investments owners have made. He believes there are only 5-10% of the rentals that will not be up to his or our standards. Government has a tendency to fix all the problems. We can’t make all the places the same. County isn’t doing their job, so the Town is trying to make new laws to make up for that. Great people work for the Town. We are blessed with the Reynolds Foundation and taking more money away from the poor. He was concerned with the designee for inspections, stated that you just can’t have anyone doing it. They have to know what they are inspecting. Flints’ are currently paying for inspections to keep insurance on their properties. He felt that just because Milan or other communities may be going this route, that doesn’t mean Osgood needs to. Where is it going to stop? Will we start requiring home inspections on disabled people and the elderly because they can’t maintain their properties anymore? Gene Flint also requested the Council to look at shortening the amount of time people get to pay their bills before shut offs are done. Norman thanked Gene for his comments and concerns. They will all be taken under advisement. service assists, and 23 criminal. He also gave Council a sample sign that could be used for the speed limit ordinance.